Strawberries on sale! That's the only excuse I needed to bake a strawberry shortcake. But in all honesty...the only excuse you'll ever need to bake is just because you want to! Now with this cake, I doubt anyone will ask why. They'll just be thanking you for it. And with one bite, you'll be thanking yourself! My favorite part of this cake has to be the mascarpone frosting. And I'm not a frosting girl. I'm usually the one scraping the majority of it off my cupcake. But this frosting is so creamy and light, I was making sure I didn't leave any behind on my plate. If you're looking for a fuss-free frosting requiring zero butter, I would try mascarpone frosting. The cheese flavor is subtle and the creamy texture makes it easy for icing and decorating your cake. Sponge cake is so easy to work with, that I always opt for layers when I make a desert from it. It's pretty easy to make sturdy, even layers. But don't let the word sturdy turn you off. It's still moist and does a great job of absorbing the flavor of your frosting when left overnight in the fridge. Separate eggs. In a large mixing bowl, beat yolks until thick about 3-5 minutes. Gradually beat in sugar, water, and vanilla. Beat in flour. In another glass bowl, beat egg whites until frothy. Add lemon juice and dash of salt. Beat until egg whites are stiff. Gently fold this mixture into the yolk mixture. Pour into two ungreased 6" round cake pans. In a medium bowl, combine the cheese, sugar, & vanilla. In a large bowl, whip the heavy cream until stiff peaks form. Gradually fold the whipped cream into the mascarpone mixture. Oh my god Melissa!!! I was so totally drooling when I saw your pic of this on Facebook. YUM. I am not a fan of sponge cakes AT ALL (one too many fruit + whipped cream Chinese sponges when I was younger), but for some reason this makes me want to try this!! Really bad! 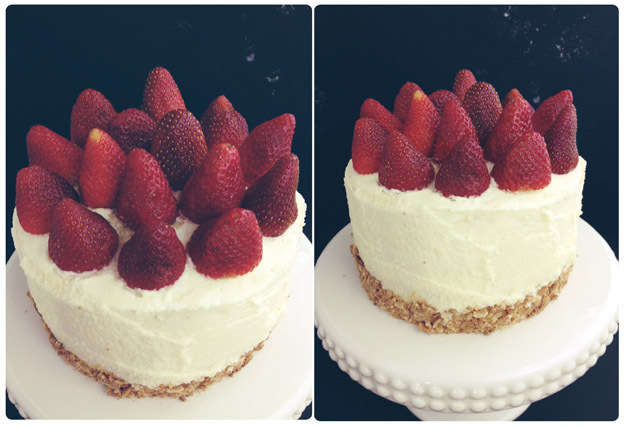 Like, I really might go home and make this tonight. Or this weekend at least. Thanks for sharing!